This book is compact and wonderful! It is the story of a grandfather and a grandson spending a couple of days together in forced isolation trying to figure out how to get along while thinking almost entirely about their needs. It is a constant struggle that results in a beautiful story of generations. Sharp, succinct storytelling and breathtaking prose combine in this new novel by the author of Ties, a New York Times Notable Book of the Year, and a Kirkus Reviews and Sunday Times Best Book of the Year. Trick is a stylish drama about ambition, family, and old-age that goes beyond the ordinary and predictable. Imagine a duel between two men. One, Daniele Mallarico, is a successful illustrator who, in the twilight of his years, feels that his reputation and his artistic prowess are fading. The other, Mario, is Daniele's four-year-old grandson. Daniele has been living in a cold northern city for years, in virtual solitude, focusing obsessively on his work, when his daughter asks if he would come to Naples for a few days and babysit Mario while she and her husband attend a conference. Shut inside his childhood home--an apartment in the center of Naples that is filled with the ghosts of Mallarico's past--grandfather and grandson match wits as Daniele heads toward a reckoning with his own ambitions and life choices. Outside the apartment, pulses Naples, a wily, violent, and passionate city whose influence can never be shaken. 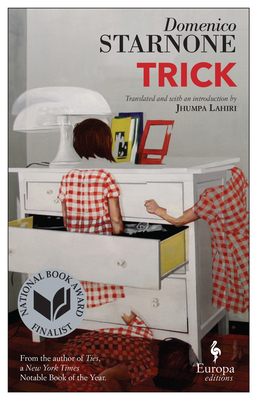 Trick is a gripping, brilliantly devised drama, "an extremely playful literary composition," as Jhumpa Lahiri describes it in her introduction, by the Strega Prize-winning novelist whom many coinsider to be one of Italy's greatest living writers. Domenico Starnone was born in Naples and lives in Rome. He is the author of thirteen works of fiction, including First Execution (Europa, 2009), Via Gemito, winner of Italy's most prestigious literary prize, the Strega, and Ties (Europa, 2016), a New York Times Editors pick. Jhumpa Lahiri is the Pulitzer Prize-winning author of The Interpreter of Maladies. Her books include The Namesake, Unaccustomed Earth, The Lowland, and, most recently, In Other Words, an exploration of language and identity.